SNEEZE GUARDS MADE TO ORDER OR JUST ORDER THE PARTS YOU NEED. PERFECT FOR RENOVATIONS, EASY INSTALLATION AND MAINTENANCE. Sneezeguard Solutions ® Ambassador Vertical Divider sneeze guard is designed to be permanently mounted on a steam table, salad bar, buffet bar, counter or table. The Ambassador Vertical Divider sneeze guard is perfect for new installations or dining room renovations. 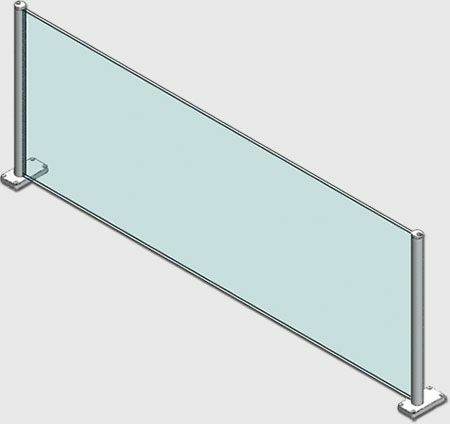 The Ambassador Vertical Divider Sneeze guard can be made to order or you can purchase the component parts and buy glass locally to fit your needs. Contact us for a quote on a custom Ambassador sneeze guard. Component Driven-Purchase only the parts you need. Gold and Silver available upon request. Accepts 3/16″ or 1/4″ tempered glass. Recommended center line spacing is 60″ for 1/4″ tempered glass and 48″ for 3/16″ tempered glass. *Please consult the custom sneeze guard chart to ensure the proper length of guard needed.